See the article by our R & D Director William L. Emkey, PhD published at Potatopro.com. Until now, anti-foam chemicals were the only commercially viable solution for foam control. Accordingly, the physical plant is designed with this solution in mind. However, with the rising prices of these chemicals and with the growing concern about processing chemicals being added to our food, the food industry is re-thinking its approach to foam control and prevention. While non-chemical solutions are now available for foam control, there are also inexpensive, but effective, improvements for existing facilities that address foam prevention. These improvements can fit into the routine maintenance of an existing plant and add little, or nothing, to the overall maintenance budget. There are also proactive modifications in existing facilities that will prevent foam creation with a very short-term payoff. For facilities that are currently in the design phase, there are numerous cost-effective design options that will greatly reduce, or eliminate, the need for anti-foam chemicals. As water flows through a facility, air becomes increasingly entrained within its volume. Once air makes its way to the surface, foam begins to form and grow. The rate of foam growth increases with the amount of entrained air. Thus, every effort should to made to minimize entraining air into the processing water. Aside from the entrained air, two other physical parameters influence the rate of foam growth. These are the speed at which the water is moving and obstructions in the path of flowing water. The faster that water moves the less likely it is to have localized foaming issues. As moving water impinges upon surface obstruction, foam tends to gather and grow. This article describes specific physical designs that contribute to foam growth due to one or more of the above-mentioned issues and the suggested modifications that minimize these issues. 1. A typical condition that exists in a water transport system is where water leaves a pipe and enters a tank. 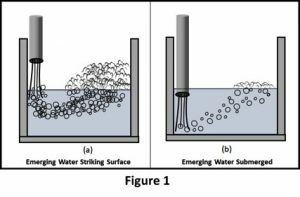 For such an event, should the emerging water strike the surface of the water in the tank (see Figure 1a), more air becomes entrained, thus, more foam is generated. However, by immersing the end of the pipe so as to have the emerging water exit below the surface (Figure 1b) the effect of an air/water interface is greatly minimized, reducing, or eliminating, the creation of additional foam. This improvement can be attained by simply adding an extension to an existing pipe immersing it deep enough so as not to create unacceptable surface turbulence. 1. 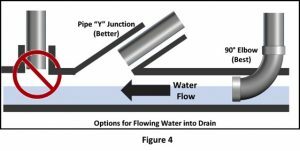 Constraining flow -Ideally, it would be advantageous to convert water emerging from a flume (a “waterfall” condition) so as to confine it to a closed pipe and treat it as mentioned above. However, this can be a difficult task, due, in part, to foaming consequences of making any transition to water flow. 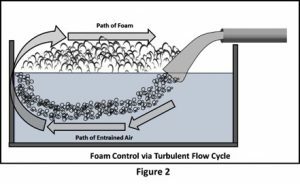 Water flow transitions, e.g., directional changes, flow speed changes, increasing confinement, etc., often result in unwanted turbulence and more foam. Thus, careful design considerations need to be taken into account should such an approach be implemented. 2. Utilizing turbulent flow – Another approach to controlling foam produced from the impact of processing water from a flume into a tank is to take advantage of its turbulent flow upon entering the water. First a word about turbulence – Turbulence, while a source for entraining air and subsequently producing foam, can also be used to an advantage in controlling foam. Typically, no foam is produced in the immediate vicinity where the processing water strikes the surface of the tank water. Instead the turbulent flow carries the entrained air down into the water volume where it subsequently rises and emerges at the surface as foam. The distance from the impact area where this foam emerges is dependent upon the speed and direction of the processing water as it strikes the surface. Foam that makes its way into the impact area is either destroyed or is carried back into the tank water. 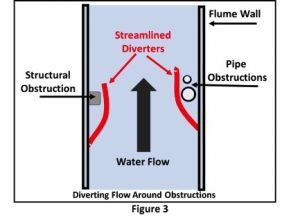 Utilizing this turbulent flow description, it is possible to design systems whereby foam levels in tanks being fed by open flumes reach an equilibrium and are maintained at acceptable levels. Figure 2 depicts such a configuration. Here the turbulent flow of the incoming process water has a horizontal velocity component moving it beneath the water toward the opposite end of the tank where it is diverted into the reverse direction. This reverse flow completes a “closed loop” in which the surface foam is driven back into the impact area where it is either destroyed or is carried into the turbulent flow beneath the surface…repeating the cyclic process. 1. Increase flow speed – It is more difficult for foam to grow in rapidly moving water compared to slowly moving or still water. The pitch of drains and flumes should be as high as reasonably dictated by the surroundings. * “Hard” obstructions – These refer to physical objects such as pipes, flume discontinuities, and surface irregularities. Once identified, the ideal solution is to simply remove these obstructions. Knowing this is not always reasonable, the second approach to solve the problem is to introduce a smooth streamlined diversion that allows the water to “slip” by the obstruction without adhering to it. See Figure 3. A hard obstruction that is commonly observed is the flow of water from a pipe into a drain, often a floor drain. This input is often at or near 90o, meaning that the ingress stream strikes the wall of the drain straight on. This causes turbulence and more foam creation. Moreover, it creates a “soft” obstruction (see below) for the water flowing in the drain. Water introduced into a drain should always enter as parallel to the drain direction as possible, and in the same direction as the flowing drain water. Some examples of a proper design are shown in Figure 4. * “Soft” obstructions – One type of soft obstruction is foam itself. Foam deposits become “seeds” for foam growth. Foam that comes in contact will easily adhere to it, especially if that foam is stationary. The solution is to prevent these “seeds” from forming…the means for which is the subject of this article. A second soft obstruction is water. When flowing water meets water from another source turbulence ensues – add air and foam is created. Depending upon the flow dynamics, the flow of either source can slow down which can also contribute to additional foam creation. To minimize this obstruction, the same design criteria as illustrated in Figure 4 is recommended. Another obstruction classified as “soft” is debris. Food processing debris often collects in flumes, especially in drains. This problem is usually alleviated by increasing the speed of the water flowing in the drain. Where possible the pitch is increased. Other means include the insertion of a high impact nozzle directing water (preferably re-cycled water) toward the debris in the direction of the water flow. 3. Drain Covers – Drain covers can help keep foam down. They can be used for localized foaming areas and to direct foam to other areas for subsequent treatment. Several materials are available for this purpose including polyvinyl chloride, urethane, and silicone-based materials. Making reasonable modifications of the physical plant of existing food processing facilities and/or by incorporating these modifications into the design for new facilities will significantly reduce the expenses associated with using anti-foam chemicals. Moreover, by combining these modifications with the recently available non-chemical means for foam destruction, chemical costs will dwindle…possibly to zero.